Most inputs are a combination of a couple of these things. (And really, interfaces are just a bunch of sensors.) Sensors are how computers and robots get information about the world. 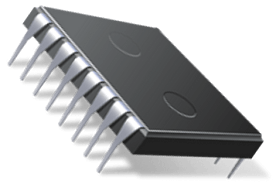 Sparki has infrared inputs, an ultra-sonic input and many others. Each sensor is especially designed to sense a certain type of information. 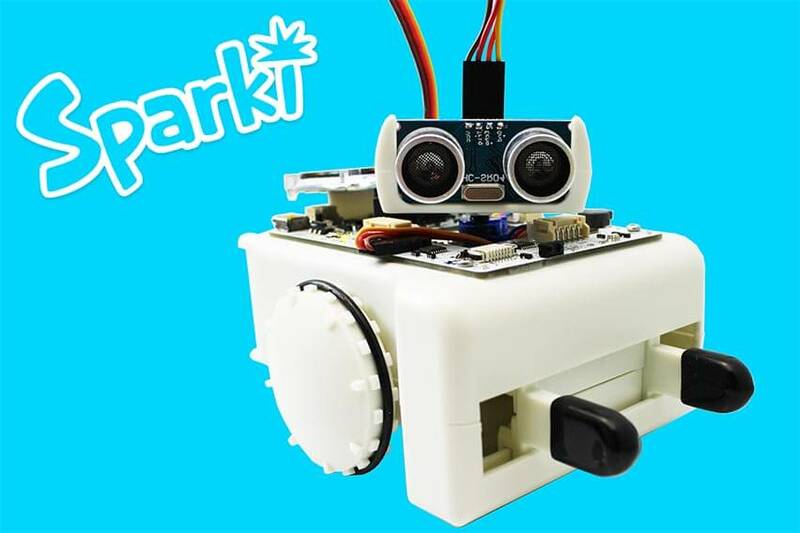 The sensors convert information about their environment into an electrical voltage and send that electrical signal to the robot’s microcontroller (the robot’s brain). Sensors can usually only sense one thing about the world- and sometimes it’s a specific thing about that one thing. For example a robot might have a light sensor which senses photons. 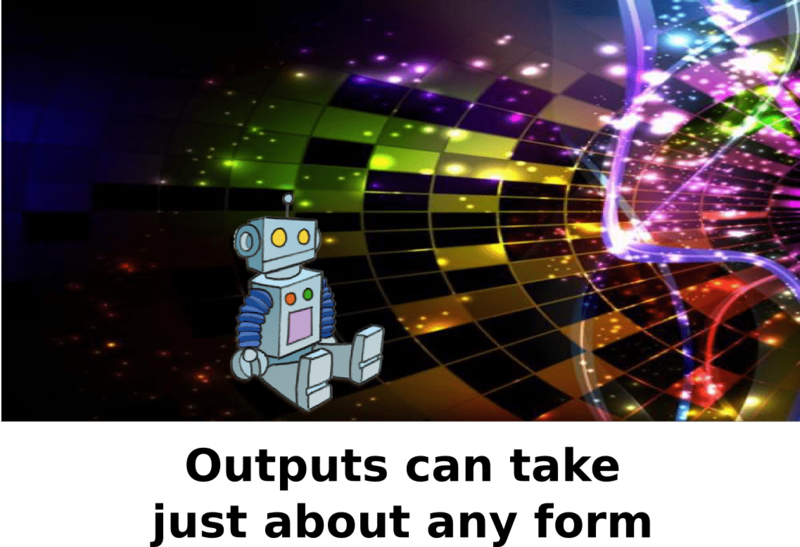 If more specific information is required that robot may also have a light sensor which senses the color of the light or the frequency of the photons. Sensors can be pretty broad or they can be extremely specific, it all depends on what you need to do with them! Computer chips are used for a whole bunch of things in robots. Often you will find them combined with sensors or as part of a communication system. They are also often used to do math that might take a robot a while to do on its own. 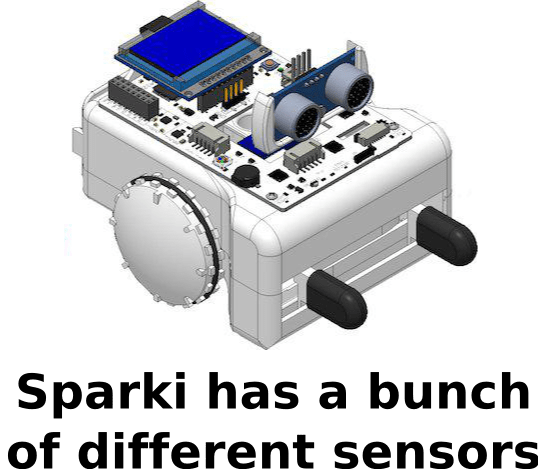 Sparki’s magnetometer (sort of a compass) and accelerometer are great examples of sensors that are in a chip form. Interfaces are anything you can use to change or get information from a robot. You’re using an interface right now to look at this information and click around the internet. Interfaces are usually both an input and an output. The input partr of an interface is also usually made up of a bunch of input sensors and probably a couple chips. One of the most common interfaces, your keyboard has a ton of input sensors on it- buttons! Another common interface, touch screens, have an output in the form of the screen and an input in the form of a capacitive film on top of the screen to sense your finger. Anything with a button, dial or other sensor is technically an interface. 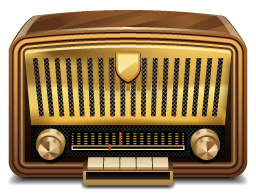 Other interfaces might not even have anything you press or touch- they may be a communication receiver of some sort. Light switches, garage door openers and dishwashers are all examples of systems that have interfaces. Even when you are not pressing buttons on your television it is interfacing with the satellites that provide the channels. Now that you know what an interface is, when you look around you’ll see them all over the place! You can think of a robot’s sensors kind of like its eyes, ears, nose, mouth and skin. The robot uses its sensors the same way we use ours- to get information about the world around us. Only once we know what is going on in the world can we start to think about moving around, beeping (singing) and moving things. Without outputs robots would be pretty boring. They would have no way to do anything to the world and we wouldn’t be able to tell if what we put into their inputs was doing anything either! Next time you see a robot or machine, take a moment to think about how it is interacting with the world. 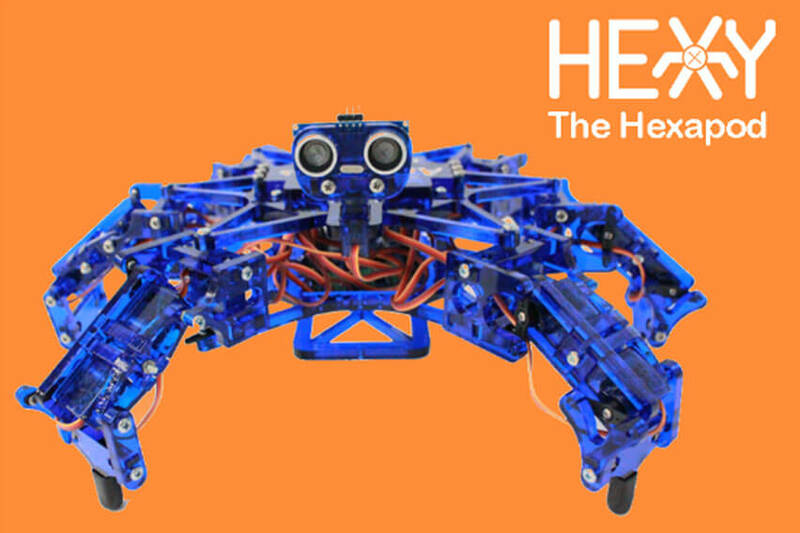 A simple robotic arm probably has at least three different motors, usually a lot more! It takes a lot of outputs working together to help a robot actually do something. These days a lot of robots are connected to each and to the internet. There’s a lot of communication going on all around us. Now that we have a little more information about inputs and outputs let’s take a look at the two different ways the robot can do these things.